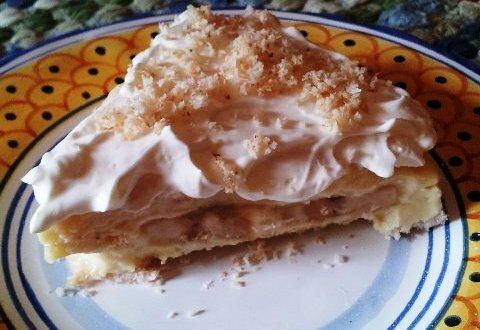 This isn't just another coconut cream pie. The coconut in this pie is in the crust. In fact, it is the crust – just two items – butter and Organic Dried Shredded Coconut from Tropical Traditions, home of their Gold Label Virgin Coconut Oil. Melt 1/4 cup butter in a large skillet over medium heat and brown the shredded coconut. Keep it moving so it doesn't burn. The shredded coconut is ready when it is golden brown. Press the coconut firmly and evenly into the bottom and up the sides of the buttered pie dish (save a little of the toasted shredded coconut to sprinkle on top of the whipped cream before serving). To help set the crust, lay parchment paper over the shell and fill with pie weights or dried beans. Chill the crust at least 30 minutes before filling. Combine the remaining 2 cups half & half and 1/2 cup of the sugar in a medium saucepan and bring just to boil over medium heat. Keep stirring so that it doesn't scorch. Temper the egg mixture by adding some of the hot half & half/sugar mix to it and then add all of the egg mixture to the half & half/sugar mix. I mixed mine with an immersion blender, so that the filling would be lump-free. Cook and stir until the mixture returns to a boil and thickens. Mine took about 5 minutes. It is critical to cook it to pudding stage or the pie will not be set when it is served. Remove from the heat. Add the 2 drops of food coloring and the vanilla and mix well. Cover the surface with plastic wrap to prevent a skin from forming and let it cool before filling pie shell. Slice the bananas into the bottom of the pie shell and then add the filling. Whip the cream with the powdered sugar until stiff and then add to the top of the pie and sprinkle with chocolate shavings or some of the leftover toasted shredded coconut. Chill at least 2 hours before serving. "Tropical Traditions is America's Source for Coconut Oil."